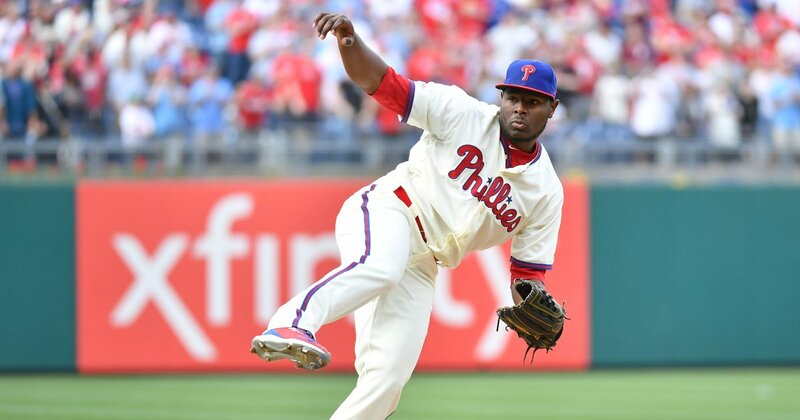 Count me alarmed by what we've seen from the bullpen so far, especially in light of a bare cupboard in the minors where lack of blue chip and high performing prospects is likely to limit what the Phillies might acquire as the season progresses. I knew Robertson did not throw 99, but I haven't seen him break 90 yet. Hope he and Serathony can pitch like they both did last year. Alvarez, NiCasio. Ramos, these are all marginal pitchers. We have quantity but not enough quality in the pen. Thus, when you have to rest Robertson, Neshak and Morgan at the same time, our quality is very low. Even Neris is always an adventure when he enters a game. I definitely think we miss Hunter. Interesting article on the state of the Phillies bullpen. The entire NL East is awful in terms of relief pitching. Two of the Phils' three losses are directly the bullpen's fault. The unit also has seen six different pitchers on the mound for end of game situations in the ninth (or 10th) innings — for save and non save situations. Ramos is still a solid young reliever. He's had ups and downs (literally). He was quite good last year. He didn't even pitch that badly last night but there was no margin for error and he made one. Kimbrel (or any of our unavailable guys) might have made one too. They do need Hunter back. And at some point they probably will need to get rid of Alvarez or Nicasio (or both) just so they can have more optionable arms in the mix. If there wasn't an off-day tomorrow they might have considered sending down Ramos (not because he was awful, but he pitched last night and is the only pitcher who can be sent down). On the other topic above, I wouldn't compare Hoskins or Nola to Acuna or Soto. They were both college players who took their time arriving in the big leagues. Hoskins could have won ROY if he'd come up sooner but he was already 24, not 19. And Nola didn't have anyone viewing him as elite in his first two seasons, just solid. Even Howard was quite hold of course but he and Rollins are the last big-deal instant impact rookies we had (at this time last year I think we'd already realized Kingery wasn't going to win it). Last night's loss was definitely painful, but it feels much less painful than the loss in DC (though I was at that game, so maybe it just felt more acute in person). In addition to pitching issues in DC, there were also a couple of key fielding errors: a missed double-play that ended up costing runs, and the missed throw to first in the eighth that allowed the tying run in. Take those errors away, and the bullpen has much more breathing room for mistakes. Last night's loss came down to missteps by a couple of players, while the DC loss was a team effort. On the other topic above, I wouldn't compare Hoskins or Nola to Acuna or Soto. They were both college players who took their time arriving in the big leagues. With teams having only 6 years of control of a player what difference does it make when a player arrives in the big leagues? Do the Nats get extra credit for Harper’s early years vs the years in his “prime” that the Phillies have him? No but if you win ROY when you are 19 you are better than someone who wins at at 24, and will probably accumulate more WAR for both your first team and your next one. But you and NYC also sort of changed the subject from international FAs to draft picks. Obviously draft picks are much more dependent on your position, and also the luck of any year's domestic talent pool. Either way, it would just be nice to have an instant All-Star or ROY, and Hoskins and Nola were not that (nor were Franco, or Dom Brown). Or in the case of our more recent draft picks just someone who piled up OPS level after level in the minors would be nice.